For so long a carton has been a four-sided box with top and bottom panels, using the largest of these panels as the primary display panel of the package. The objective for package design has always been to balance this messaging for maximum consumer awareness and attraction. Yet in some cases there is so much content on these panels, it makes it difficult for consumers to navigate all the content quickly and efficiently. Yet, right in front of me was a reengineered carton that added a panel through the simple use of a changed dye – by adding one additional “fold” if you will, it transformed a square corner fold into a panel large enough to add color and copy. In this case, adding a bold color bar with “Non-GMO” reversing out of it and a second package with the color bar communicating “Organic”, creating an out-of-the-ordinary way to deliver key communication to consumers concerned about food content. So why hasn’t this modified carton structure been more widely utilized? I don’t have an answer except that perhaps it added cost or created carton instability. But Peace Cereal did it and created something uniquely special – augmenting a direct and uncluttered approach to cereal packaging, and generating above average shelf impact. 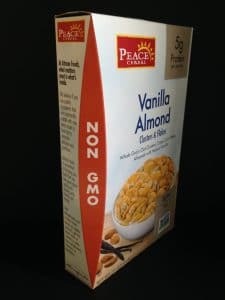 Obviously, to consumers, the fact that the cereal is a non-GMO or organic product is an important one – the face panel clearly presents the standardized icons, which may have been enough to communicate with consumers, but using this additional panel reinforces this message, almost creating its own category. Not only does this work on the individual package, but it also serves to set it apart from competitive products on the shelf. As a consumer and a designer, I look for products and packages that stand out in a noticeable way. Maybe it’s just me, but after a while shopping gets boring, looking at the same things week, in and week out especially as shelves and aisles become increasingly crowded with merchandise. I like being snapped out of my shopping autopilot by packaging that challenges paradigms and perceptions. It’s very exciting to find a package like this one that breaks with the norm and works in an above average way to distinguish the brand and disrupt the category. Many times, packaging teams don’t make the effort to look at the simple ways they can achieve differentiation between their product and the competition, for fear that it may add cost or complexity. 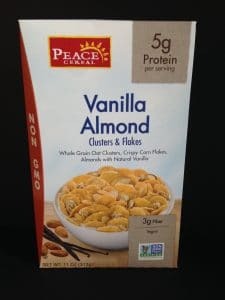 Certainly, the goal is not to create a package that is cost ineffective to produce, but the Peace Cereal package demonstrates you don’t have to go too far outside the box to be different and have an impact. I congratulate Peace Cereal for striking out with this new structure. I only wish I was the one that came up with this simple but effective idea. 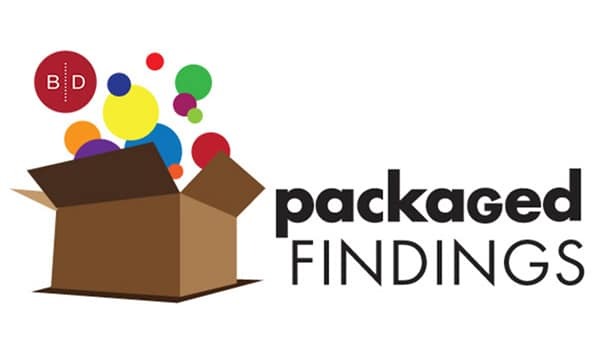 If you are thinking of exploring innovative packaging to renew or refresh your product line, contact us at 920-725-4848 or info@brand-directions.com. Throughout our 60 plus years in supporting customers with consumer brands large and small, we apply our experience and expertise to the entire process to create efficient and effective solutions. Our team knows the best tools, and most effective visuals and messaging to make your brand not only stand out but win in the marketplace.